This issue includes essays on a queer philological reading of the word like; forms of participation in art; queer intimacies in social media; Spinoza’s political writings and the concept of imaginatio; the role of racial logics in decolonization; the exhibition Photo Requests from Solitary and its depiction of the dreams and desires of prisoners in solitary confinement; and management of multiculturalism explored through the “Thanks to Berkeley . . .” photo wall on UC Berkeley’s campus. Contributors include William Callison, Michael Mark Cohen, Jason De Stefano, Stephen Dillon, Peter Galison, Anne Gräfe, Daniel Hendrickson, Tara Hottman, Marianne Kaletzky, Leigh Raiford, Juliane Rebentisch, Tom Roach, Martin Saar, Michael D. Snediker, and Neferti X. M. Tadiar. 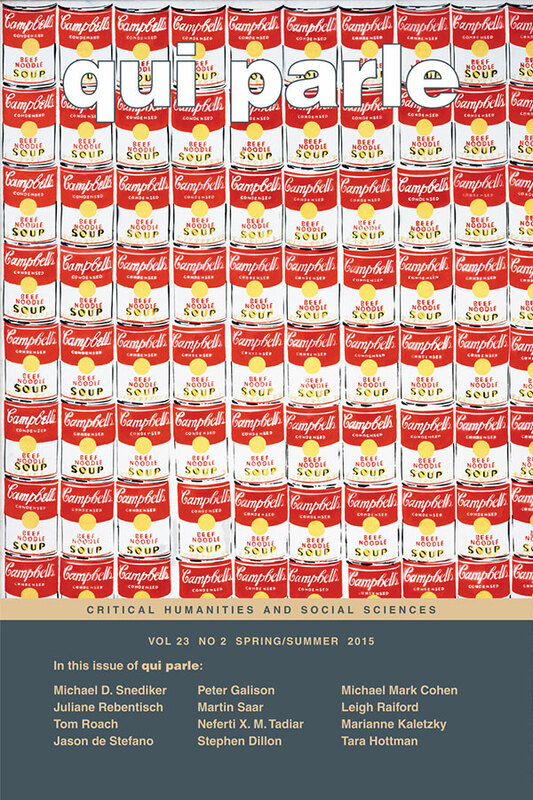 View the table of contents for Qui Parle 23:2, at the journal's online site.